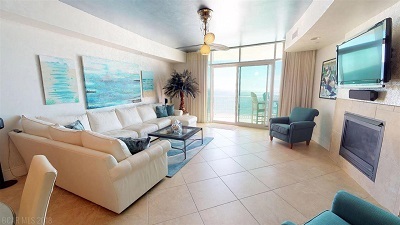 Orange Beach condo for sale at Turquoise Place. This 3 bedrooms and 3 ½ baths unit has many custom upgrades, which include 24" porcelain tile in common areas and carpet in bedrooms. Private hot tub/natural gas grill on balcony. Subzero/Wolf/KitchenAid appliances, including natural gas cook top, double oven with microwave and warming drawer. Wine cooler & ice maker. 3 cm granite countertops. Natural gas fireplace, flat screen TV, and built in electronics niche. Entertainment center surround sound in living room. Full-size laundry room with high-efficiency, front-loading washer and dryer and laundry sink. Jacuzzi brand master bath suite which features full-body shower & jetted tub. Hansgrohe plumbing fixtures. Custom entry and interior doors. Faux paint and custom painted ceiling in entry hallway, kitchen, dining, and living room. Electronically controlled ceiling fans. Dimmable lighting. Fan/light/AV remote in living room and Master Bedroom. Fully stocked kitchen. This unit has never been rented but has excellent rental potential. Hot water heater, dryer, and ice maker were replaced within last 2 years.